President Chun Gi-Pyo (left) of Global Liquor poses with Mr. Suh Han-Jeong (right), president of Korea Wine Society at charity party. 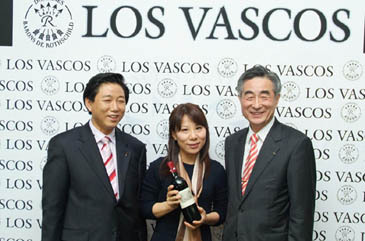 President Chun Gi-Pyo of Global Liquor hosted a charity wine party to mark one year of the launching of its Los Vascos, Chilean wine, to the local market at a Mercedes-Benz Korea showroom in Nonhyun-dong, southern part of Seoul on April 26, 2006. The wine tasting party was blended with a fashion show, British jewelry, a concert by local singers, and a glitzy Mercedes Benz, drew scores of wine connoisseurs, local businesspeople, as well as members of SIWA (Seoul International Women's Association), EUCCK (European Union Chamber of Commerce in Korea), and FKCCI (French Korean Chamber of Commerce and Industry). Among the VIP participants was Mr. Suh Han-Jeong, president of Korea Wine Society. Some of the proceeds from sales of wine and jewelry in the charity event will be spent for the Korean cultural assents housed in Louvre Museum in Paris, according President Chun. Shown at the Mercedes Benz showroom were all kinds of jewelry of British brand Aislinn, local furniture of Kwon's shop, various kinds of Los Vascos products, one of the world's top 10 wine brands. David Chang serves as marketing director for The Seoul Times. Chang studied new media at Kwangwoon University's graduate school. He is currently studying theology at the Methodist Theological Seminary's Grduates School. His hobbies are playing the guitar, swimming, and working out at health club.